mairuru: Thank you very much for your entries!!!! I'm really happy to get so much comments (they are too interesting!!) for me. So when I go out today, I got these to make some extra giveaways. I think of choosing some more winners because seven people seem too few for you all. Now I'm preparing for the drawing. Please give me some time to tell you who are the winners. Today I went for a 3 hours walk with my Tomato (in me). I enjoyed spring flowers and greeted Bo-chan. And I found these fabrics in a small craft shop. These two has similar cute squirrels. The brown one is cotton double gauze, so I'll make clothes for my Tomato with it. Oh, about the Sashiko what I showed in my previous post, I finished them. I put them on the arm when I cook to keep my clothes from getting dirty. I'm thinking how I call them in English. In Japanese, they are "Arm cover". Do you know them...??? I like that pink fabric with the squirrel!! So cute!! Hmm...I have no idea what those arm covers are called in English, but I think just calling them "arm covers" would be okay? wow you found some lovely fabrics, and how sweet are those notebooks!! it can be so exciting to suddenly find fabric in a store when you least expect it. Wow! The fabric is to die for! You always manage to find (and show us all-of course) the most beautiful fabric! The arm covers are lovely! hello!!!!!... yo siempre te visito, aunque no te dejo comentarios pues mi idioma es español y no quiero complicarte, pero soy una muy cercana seguidora tuya ya que admmiro lo delicado y bello de tu trabajo. I've been reading your blog since last week and I've already gotten a few of my friends to read it too! You are very good at writing and taking pictures and you are so good at making things!! Lovely fabrics that you got and nice arm covers. The fabrics are very sweet and delicate. I'm happy you can walk with your little Tomato! Sweet walking and sweet sewing! Don't go over the top because there are so many of us ;-) I really like your arm covers. I've seen them for the first time, though. We only use aprons, don't know why we leave out the arms?! Enjoy the time with your little Tomato. Oh, and I sent you an email, I hope that it is ok.
Mai: I found a better name for your arm covers: Cooking Sleeves!!! I still remeber as one of my best memories in life the long walks I was taking when I was pregnant, I was unstoppable, delightful! Beautiful fabrics indeed, I find so few good ones here in north Italy ... such a shame. I like your arm covers! But I think Raquel from Florida got a great name: Cooking sleeves sounds great! I'm your silent reader for quite some times now and I just love reading your blog you got me so inspired to have my own blog on craft and sewing. Just wondering, how do you put on those 'arm covers' it would be interesting if you could show it to us how to wear those beautiful arm covers. You are so creative! The fabrics are adorable! You have good taste. The fabrics are adorable! 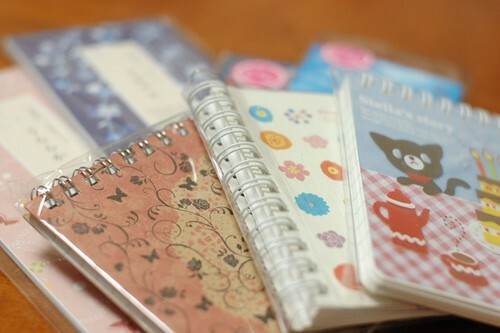 And the notebooks are so cute! Something I remember from when I was young and lived in japan. I used to love buying japanese erasers. They had so many cute designs AND they smelled good! American erasers don't smell nice at all. 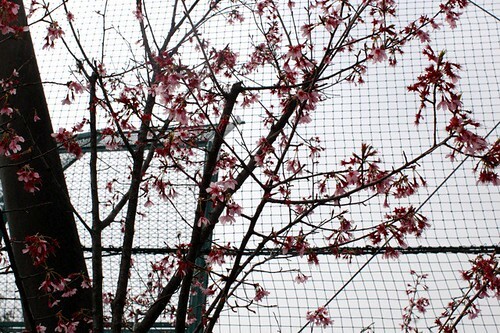 Here the trees are flowered. So beautifull!! I walked yesterday whit my dog, he was so pleased! As always, you have a lovely taste to choose fabrics for your work. I've never seen those arm covers in the U.S., but I think it's a very smart thing. I may have to make some for myself! Those arm covers are perfect for someone like me who loves to cook but is always afraid of the teensiest oil splatter. I would call them: Apron Wrist Cuffs; that way, people know they are to be worn in the kitchen and they are somewhat protective for messes, they know where they are worn - and cuff just sounds nicer than cover. Let us know when they're up in the Etsy shop - or if you decide to post a pattern PDF in the shop or whatnot - I'd love to feature it in my blog - I can see it catching on bigtime! PS - How is that wee tomato doing? I would call them arm covers, but as other commenters noted, I've only seen them in Japanese magazines, both for cooking and also in my kindergarten accessory book. They seem very practical, I would think they would be useful. Oh, that last comment from Brian was really from me 8-) I didn't realize my husband was signed in. Beautiful fabrics! and your "arm covers" are very cute!! the fabrics are very beautiful , they will look lovely for your comming baby .my Rio enjoy the colors . I wish I could go shopping with you. 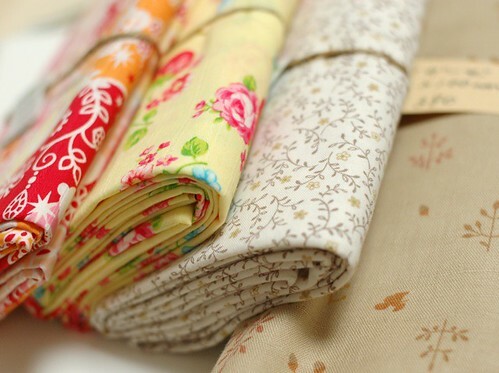 You found the most adorable fabrics! Arm covers seems like an appropriate name. You could use those when you clean house to. 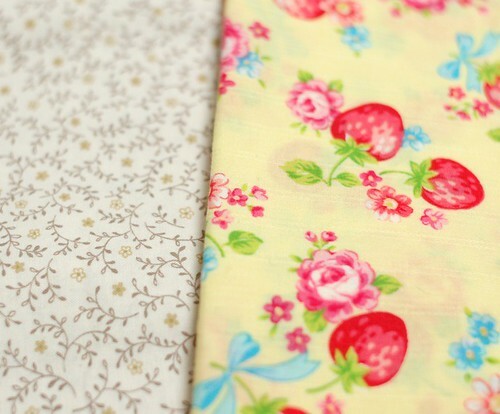 Lovely fabrics you managed to find, I am jealous! 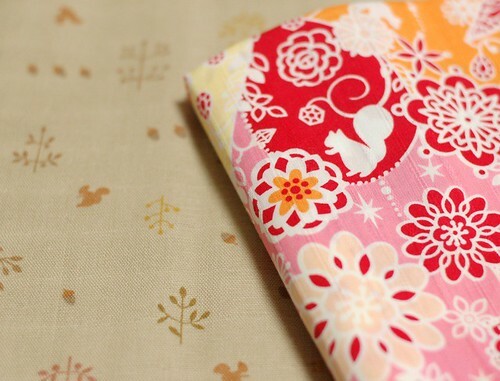 the squirrel-fabrics are so beautiful! And the ones with the flowers too. Your tomato will look gorgeous with its handmade clothes! One of your commentor commented that the cover is familiar because she's from an Asian background, so am I but I have never seen those arm-sleeve covers before!! It's pretty interesting the concept of it too, hehehe. Dear Mai, so sweet of you to add more goodies to your giveaway so more of us get a chance to win something! :) The four fabrics you picked are really gorgeous. I especially love that japanese traditional flower with the squirrel and that gorgeous shabby chic rose with strawberries yellow fabric. Love love love! I love your Sashiko arm covers lots. Looks good for use in crafting and painting. Have a lovely merry happy week and love to you! Your 'arm covers' look great...seems such a pity too put your sashiko on something that will get dirty! I dont know them, but this is a genius idea!!! Thank you very much for your comments and great ideas! I like "Cooking sleeves" and "Apron Wrist Cuffs". Thank you so much. I'll think a little about the naming. Now I'm making the tutorial of them and I ask to Haru to take some pictures when I put them (* v *)!!!! Love your blog and hand-sewn items, they are constantly inspiring me for work! Very nice fabrics! Wish we had anything similar available here. Good luck to everyone! My name is Erika, and I like your blog, your hand work is an inspiration. This is the first time I leave a comment but I check your blog almost every day, I get excited to see what you have post that day. I hope your pregnancy is going well!! I discovered your Blog around 2 days ago and are already in love with it. It's gorgeous how you sew everything by hand. Mai, I love the arm covers. You'll look so cute in them. Also, nice fabric purchases. Tomato will be one cute baby in an outfit made in the double gauze. Si! Li conosco ! Wakarimasu! Itariago no kotoba wa "Manicotti" desu. Kawaii desu ne! Dear Mairuru yours sewing-craft are very amazing!Ciao dall'Italia. I have never heard of arm covers before. They are very nice. I'd like to learn sashiko someday. I wonder if you are live in Kyoto. I am going to visite Kyoto and could you please recomment some nice cloth shops? Thanks a lot. 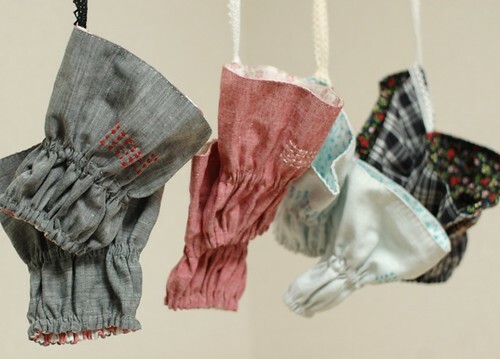 I just wanted to say that I came across your blog courtesy of SewMamaSew, and love it so much. I really enjoy seeing what you have made, and what life is like in Japan (where I would love to visit one day). Nice, I had been following this blog for a jiffy but I didn't become aware of that you guys we're behind it. Some of the crew from there is really remarkable but they are lacking a demo link. More and more interest and involvement would definitely bump up the experience for me and in all probability many others. It is not so much the idea that generates interest and debate but the varying interpretations of how the concept might be translated into practice. 've been studying your website since the other day and I've already gotten a few of my buddies to study it too! You are very excellent at composing and capturing images and you are so excellent at making things! !